Legendary Guitarist/Vocalist Dave Mustaine of Megadeth brought the best of his nihilistic cynicism to Chicago for Heaven and Hell Tour 2007 on May 5 at the Allstate Arena. He and Rhythm Guitarist Glen Drover, Bass Guitarist James LoMenzo and Drummer Shawn Drover pounded the ears of thousands of loyal Megadeth fans with their menacing, rebellious thrash. Megadeth joined metal band Machine Head for the Tour, as well as headliner Black Sabbath, a.k.a. "Heaven and Hell," featuring Ronnie James Dio, Toni Iommi, Geezer Butler and Vinnie Appice. We stayed for Black Sabbath, but we came for Megadeth - my old school, speed metal buddies and I. And there were many likeminded fans in the arena. Rumors of a "Rust in Peace-heavy" set list had us all fidgety with anticipation. We were as a group of believers awaiting the rapture of Mustaine's guitar. But once Dave plucked his first string we turned into behemoths, screaming and thrashing as if trying to bring down the proverbial gates of hell and issue forth the maniacal demons of speed metal to fuel our lust for Megadeth's music. Megadeth made the most of the 45 minutes allotted them, playing their first ten songs with no breaks. But we kept up, thrashing unceasingly. It helped that every other song was from our favorite, and Megadeth's most highly acclaimed album, "Rust in Peace ." They also played our favorites from "Peace Sells...But Who's Buying," "Countdown to Extinction," and their last album, "The System has Failed." We got a live preview, as well, of their new songs "Sleepwalker" and " Washington is Next" from their latest album "United Abominations" which was released ten days later on May 15. Megadeth's tenth song was "Peace Sells," to which the fans unleashed their last bit of manic energy. While the band rested, shrieks of thousands of appreciative fans deafened us. People were whistling, clapping, cheering and shouting "Megadeth, Megadeth!" 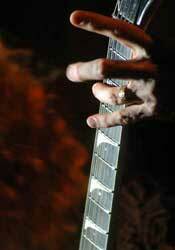 In response to the fans, Mustaine walked confidently to the front of the stage and growled "I love Chicago!" Even louder shrieking ensued. In his bio on Megadeth.com, Mustaine lists his three favorite venues as Buenos Aires (internationally), Chicago (nationally), and America West Arena Phoenix (locally). 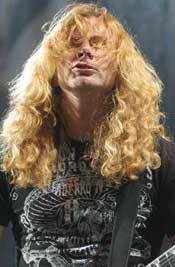 "I'm actually missing an Oscar de la Hoya fight tonight so I can play for you," Mustaine told his fans. "I hope he wins. Actually I win, because I get to play for you!" Mustaine wished the Latino fans a happy Cinco de Mayo with little crowd reaction. He seemed disappointed, probably hoping for the same ecstatic response he received in Buenos Aires, Argentina at the concert recorded on Megadeth's recently released DVD "That One Night: Live in Buenos Aires." Mustaine forgot to mention that the Kentucky Derby was also going on that day. Megadeth sure sacrificed a lot for their beloved Chicago followers! The show climaxed with "Holy Wars...The Punishment Due." Mustaine laid down his galloping opening riff and we all erupted, Megadeth and the fans both. Using up our last bit of strength, we thrashed to the last note then fell into a euphoric afterglow. Droplets of sweat traced the huge grins on our faces as we walked toward the refreshment stands, thoroughly satisfied.